We mark our lives by certain milestones, whether by days or nights, successes or failures, highs and lows or perhaps midnights and cups of coffee. One of the ways I create milestones is by movies, if a movie has a very powerful effect on me, its something I carry for the rest of my life. The first time I saw "Pulp Fiction," I was in grade school. I was not allowed to see R-rated movies, but I had a friend who could, and he was just as much in love with the world of cinema as I was. When we'd get together at his house, we basically got to watch whatever. I'll never forget the summer night when I got to sleepover at his place I watched "Pulp Fiction" for the first time, completely chemically rewired from the experience. 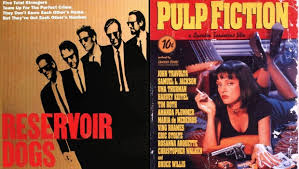 I had been a movie fan before "Pulp Fiction," but I had never seen anything like "Pulp Fiction" in my life. It sprawled out the way I view films, it showed me what could be done in the world of cinema, it showed me that there are no boarders; just boarders filmmakers set themselves. As I said, I was chemically rewired by the experience. When I was in high school, the same friend and I got together one weekend and we watched "Reservoir Dogs." It was with that movie that I knew Quentin Tarantino, director of both "Reservoir Dogs" and "Pulp Fiction" would be part of my life forever. It is kind of hard to remember a time before Quentin Tarantino was making films like "Inglorious Basterds," "Kill Bill," or "Django Unchained." Don't get me wrong, those films are cool and they are all movies I love on a primal level. With that said, I think "Pulp Fiction" and "Reservoir Dogs" are a completely different type of cool compared to Tarantino's later work. I think in the early 1990's, Tarantino had a flair for crime noir. He loved exploring the bizarre worlds of cops and robbers and brought that type of movie to a whole new dimension. The watermark Tarantino left was felt by many, and several filmmakers tried to duplicate that type of cool, but I assure you that nobody makes them like Tarantino can. Instead of playing with genres, Tarantino created a new golden age of gangsters on film and he put a unique spin on how these characters react in the world. There are some things that I don't think will ever change about Tarantino, things I hope he never looses. Take the beginning of "Reservoir Dogs" for example. If you had no prior knowledge of the movie, you'd have no idea what you were about to see. The film begins in a diner, and that classic Tarantino slow-panning, camera is going around a group of men sitting at a diner. We don't learn much about them, just that they like music and that one of them hates tipping. Even though its roughly a ten minute scene, it feels longer, only because we feel like we sitting there with these guys. That leads into the slow-motion walk back to their car as the opening titles commence. Then, if you look at the opening scene in "Pulp Fiction," we abruptly land in the middle of a discussion between a man and a woman, they are clearly nervous about something, but we can't really make out what. Then before we know it, they kiss each other before holding the restaurant up for a robbery. Both scenes are electrifying, and Tarantino proved that he was going to be one of the all-time best monologue writers. Honestly, he might be THE best. Not only is Tarantino good at writing monologues, but he was equally stunning putting together big-time ensembles and letting them loose in front of the camera. "Reservoir Dogs" followed a group of criminals played by Tim Roth, Harvey Keitel, Michael Madsen, Steve Buscemi, Chris Penn, Edward Bunker and Tarantino himself. The criminals worked for a mysterious crime lord played by Lawrence Tierney. That is an incredible cast for a tough-guy movie, and Tarantino makes sure each of his actors gets time to shine in front of the camera. It doesn't matter which movie Tarantino makes, he always gives each character a great scene, whether they are lead or supporting. When the film's big heist goes wrong, we learn there maybe an undercover cop in the midst of the criminals. The actors make sure we feel every inch of their paranoia, all while enjoying the instantly original dialogue Tarantino wrote. There will be nobody who writes cooler, juicier, more original dialogue than Tarantino and that was present in his first movie. Then there is "Pulp Fiction," and man, how do I describe this to people who haven't seen it yet? Well, I guess I'll start off by saying that it relaunched the career of John Travolta, as his Vincent Vega is one of the best parts of the movie and Travolta relishes each and every line and scene. Travolta is matched by Uma Thurman and watching "Pulp Fiction," it pretty simple to see why Tarantino fell in love with her. Her Mia character is the cool several boys dream of dating, but never find and Thurman clearly had a great time playing her. Then there is Samuel L. Jackson. His work as Jules Winnfield proved why Jackson is now and ever shall be the King of Cool. Bruce Willis and Ving Rhames have a great little story and they easily share the most shocking scene in the movie. If you've never seen it, you'll know it when you see it. It is the most wild mix of terror and satire and bizarre all wrapped into one scene and I still can't believe Tarantino pulled it off. We also run into Harvey Keitel, Christopher Walken, Tim Roth, Amanda Plummer, Rosanna Arquette and Peter Greene. Remember Peter Greene from "The Mask?" He's in this! Describing the plot of the movie itself? Well, that it tough. I would call the film a day-in-the-life of two hitmen and one boxer, because its difficult to try to pull a plot out the movie. It's a movie that isn't shown in chronological order, characters don't talk in order to move the plot forward, they talk just to talk. There are more pop culture references in this movie than I can count. It is hyper-violent, racist and misogynistic at times. Yet, over the years, as I have shown this movie to people for the first time, they can't help but fall in love with it. I don't want to act like there is no plot in the movie, there certainly is, if you are willing to play Tarantino's game. Will 2015 Be The Year of the Spy?